How To Increase Protein In Diet For Elderly People? The minimum protein needed for an average healthy adult was set in 2003 at 0.80 grams of protein per kilogram of body weight. But many recent studies point out that this amount does not do justice to the protein needs of the elderly and critically ill. There is a growing body of evidence that this recommended dietary allowance (RDA) is not sufficient for older persons and that they would benefit from eating more proteins. As per a study published in a 2004 edition of the “Journal of the American College of Nutrition”, seniors need more protein than many younger adults. The said study alludes that though the recommended dietary allowance for protein is 0.8 grams per kilogram of body weight, seniors need minimum 1 gram of protein per kilogram, or about 0.45 grams of protein per pound of body weight every day, and even more protein during times of physiological stress (Source). The irony is most of the older adults are not able to get enough protein to fulfil their daily minimum needs. They tend to feel full after eating less food, so nutrient-dense foods should be encouraged instead of empty-calorie choices. 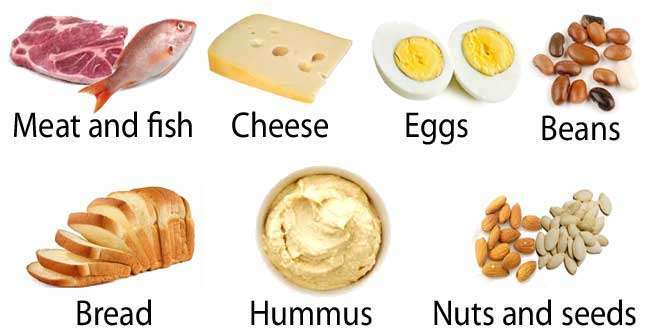 They need to include 2 or 3 servings of high-protein foods in order to meet their daily protein needs. So, I thought of writing this post on how to increase protein in the diets of elderly? How To Add Protein To Elderly People Diet? An elderly person should eat about 25 to 30 grams of high-quality protein at each meal to help increase his/her protein intake in order to prevent or slow age-related muscle loss. Read on here what foods elderly people should eat to increase their protein intake so as to meet their daily protein needs. According to a study in the 2004 “Journal of the American College of Nutrition”, egg is a great source of protein for the senior persons due to the fact that it is easy to cook, inexpensive and readily available. Egg provides all of the essential amino acids your body needs each day from foods to produce proteins within your body. One egg provides almost 6 grams of high-quality protein. Caution: The persons having high cholesterol should not eat eggs more than 3-4 times a week. Moreover, they should never be eaten raw. Animal products like beef, pork, chicken and fish are high sources of protein and provide about 22 to 26 grams of protein per 3-ounce serving. Dairy products are a rich sources of high-quality, complete protein, have a soft texture and are generally less expensive than meat. Low-fat milk offers 8 grams of protein per 8-ounce glass, and one-half cup of cottage cheese contains about 12 grams of protein. Other cheese choices such as Swiss, cheddar and mozzarella contain 8 grams per ounce. Yogurt is another high-protein dairy product with 12 grams in an 8-ounce serving. Nonfat dry milk powder provides 3 grams of protein per tablespoon. Try mixing it into soups, sauces and mashed potatoes according to your taste. Note: One research paper published in a 2004 edition of the “American Journal of Clinical Nutrition” reported that elderly men who consumed higher amounts of high-calcium dairy foods had greater bone mineral densities. It also asserted that calcium supplementation can protect women and men from bone loss. If you are lactose intolerant or follow a vegan diet, soy milk, soy yogurt or tofu are great options for you. They are rich sources of high-quality, lactose-free, plant-based proteins. Many of these soy-based foods are rich in calcium too. Tofu is soft, easy to chew and less expensive than most meats. A research paper published in a 2010 edition of the “Journal of Clinical Biochemistry and Nutrition” claimed that phosphatidylserine made from soybeans might improve memory function in elderly persons with memory complaints. Black, red and kidney beans also provide good amounts of protein. You can add these to soups and stews. One half cup serving of nuts and beans provides 8 grams of protein. For the elderly people who have no chewing problem, nuts like almonds and walnuts offers 7 grams of protein per ounce. You can spread peanut butter on toast, crackers or fruit and get 4 grams of protein per tablespoon. Soybean products provide a good alternative protein source to animal foods. Protein supplemental drinks are a worth trying option for elderly people, especially for those who have poor appetite. Protein drinks for seniors are dense in protein; so even a small amount will provide sufficient dose of protein nutrition. These beverage-shakes can be sipped between meals or mixed into with recipes that call for milk. Most brands are dairy-free to accommodate people who are also lactose intolerant. Muscle mass change Protein supplementation immediately after training: no significant effect on increase in lean mass. Protein-supplemented and placebo: gained on average 0.8 kg LM and 0.6 kg aLM Physical performance Protein supplementation after training did not improve strength and performance more than exercise alone. Both groups increased quadriceps strength by 55 N and improved Timed-Up and Go test by 0.6 s.